The Powamu Festival is the mid-winter ceremony and also called the Bean Planting Festival. It is observed in late January or early February. 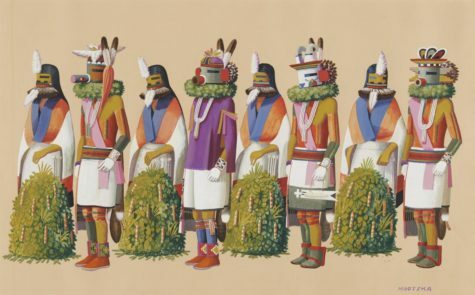 The celebration lasts 8 days and is mainly celebrated by the Hopi Indians in Arizona. 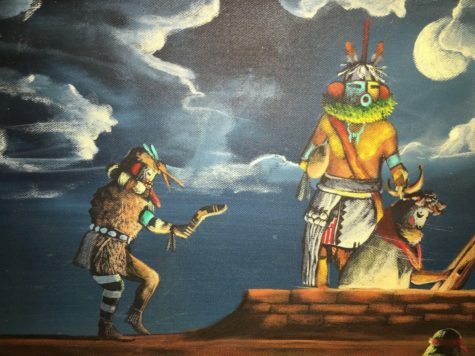 The preparations for the ceremony include repainting of the masks that will be worn by those Hopi who impersonate the Katchinas. On the third day, young men bring baskets of wet sand that they leave near the entrance to the kiva, the ceremonial meeting room (see more about this on Wuwuchim page). A hot fire also burns in every kiva of very Hopi village the entire 8 days of the Powamu Festival. Blankets are also stretched across the opening so that the atmosphere inside is similar to a hothouse. Each man who enters the kiva during this period carries a basket (or bowl) of sand into it. He also plants a handful of beans, which sprout really fast due to all the heat and humidity inside the kiva. Why bean sprouts? The Hopi believe that bean sprouts represent fertility. Because the Hopi rely strongly on the Katchinas to bring rain (and other good weather conditions) essential to the growth of their crops, bean sprouts also symbolize the approaching spring too. 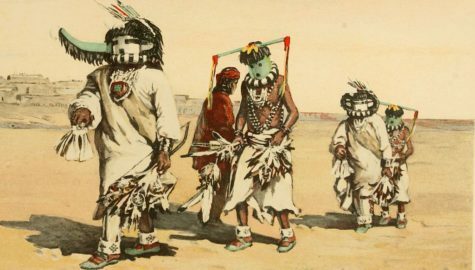 The Powamu comes to it’s conclusion with a dance that takes place in the nine kivas that dot the northeastern Arizona mesa. The bodies of the dancers are painted red and white and they wear squash blossoms in their hair. These are really yucca fibers twisted into the shape of a squash blossom. They also wear white kilts and sashes, plus leggings with a fringe of shells tied down the side. The dance takes place inside the hot kiva and is done in two lines. When the dance is over, the dancers then leave for the next village’s kiva, and another group arrives. 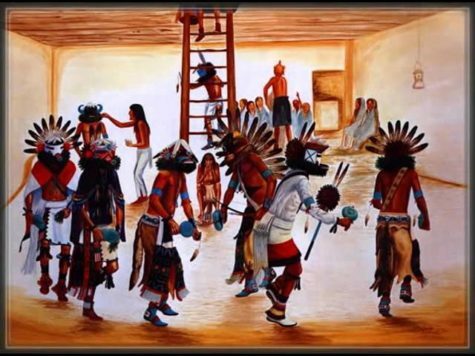 So, by the time the night is over, each group will have danced at all of the nine kivas. Clowns run around making jokes, tripping each other and performing pantomines for everyone’s pleasure and fun. The conclusion of the Powamu ends with a feast in which bean sprouts are the main ingredient. The men who impersonate the Katchinas wear masks which vary from year to year. A few of the masks will, however, remain the same. Before the dance, the masks are repainted and refurbished. They are made to fit closely over the head, hiding it totally. There is also a ruff of feathers, fur or spruce at the neck. The face on the mask usually resembles a bird, a beast, a monster or a man or a combination of all of these. The Soyokmana is a witch-like creature that carries a crook and a bloody knife. She goes along with the Katchinas as they go from Hopi village to another visiting their kivas. This group also goes from house to house demanding food, receiving gifts and presenting bean sprouts. When the food they are offered does not meet their requirements, the Katchinas get upset and make hooting and whistling noises and refuse to leave until they have been properly fed! (This sort of reminds me of trick or treating on Halloween.) Sometimes that mean ol’ Soyokamana will use her crook to hook a child around the neck and hold him or her there, screaming in terror. Parents tell their children that this is a punishment for being naughty. The price for this sudden wisdom is to participate in a ritual flogging or whipping ceremony. Now, the children are NEVER struck hard enough to cause serious injury or pain! This ritual is not intended to be cruel. In fact, sometimes a child who is really frightened, isn’t flogged at all but has a yucca whip whirled over his or her head. Occasionally, an adult will be flogged too, which is believed to promote healing. 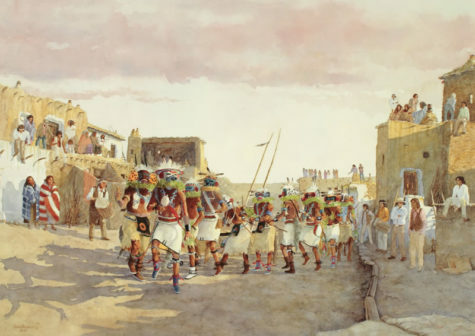 For four successive mornings, the child who has been flogged is taken to a special place on the mesa where he or she can make an offering at a shrine and casts meal towards the sun. During the first 3 days of this 4 day period, the child is not allowed to eat salt or meat. But, on the fourth day, these rules are lifted. And, from this time on, the child is now allowed to look at the Katchinas without their masks and at other sacred objects in the kiva without incurring any punishment. One practice consists of lighting and burning a Yule Log. If you choose to burn one, select a proper log of oak or pine. Carve (with your Bolline) or chalk upon it a figure of the Sun (a rayed disc) or the Horned God (a horned circle). Set it alight in the fireplace at dusk, on Yule. This is a graphic representation of the rebirth of the God within the sacred fire of the Mother Goddess. 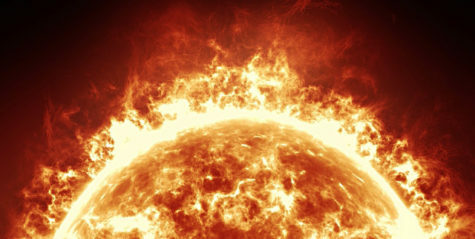 As the log burns, visualize the Sun shining within it and think of the coming warmer days. Traditionally, a portion of the Yule Log is saved to be used in lighting next year’s log. This piece is kept throughout the year to protect the home. 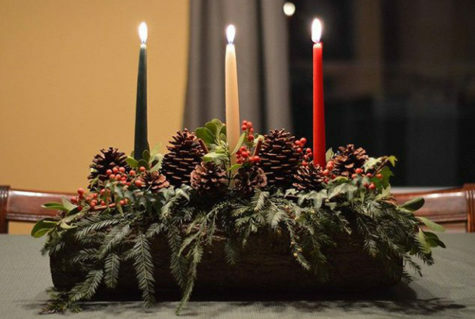 The second type of Yule Log is not burned up, but rather holds three candles for burning. Find a suitable log of oak or pine and flatten one side of it so that it will lay flat. Drill three holes in the side that is up, the correct size for holding three taper candles. 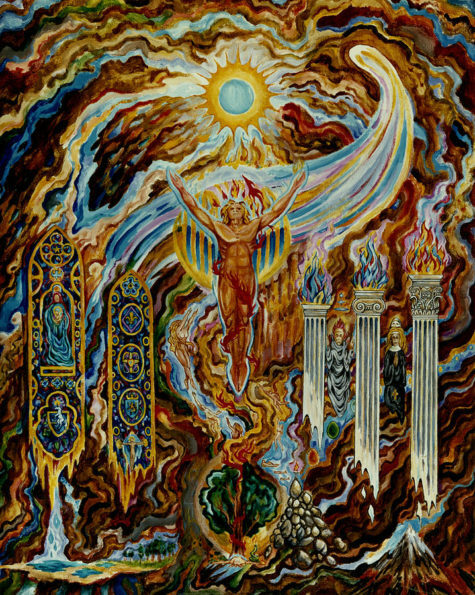 The candles should be red, green and white (to represent the season), or green, gold and black (to represent the Sun God), or white, red and black (to represent the Great Goddess). You can further decorate your Yule Log however you choose to – using holly, mistletoe, red ribbons and bows, or whatever you prefer. 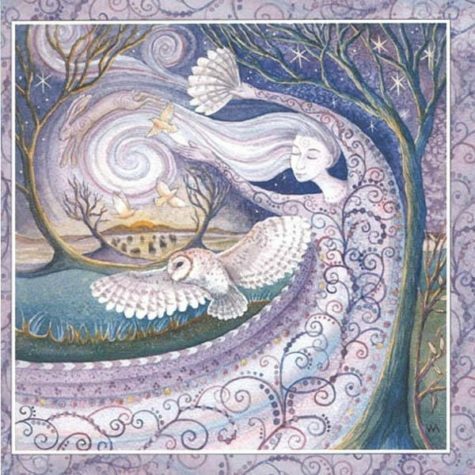 The Winter Solstice or Yule is one of the Lesser Wiccan Sabbats, and it is also the shortest day of the year, and hence – the longest night. This usually takes place on December 20th or 21st, although it does sometimes occur on the 22nd or 23rd (check your calendar as it changes from year to year). Feill Fionnain (Pecti-Wita Tradition, which falls on December 22nd). Yuletide lasts from December 20th through December 31st. 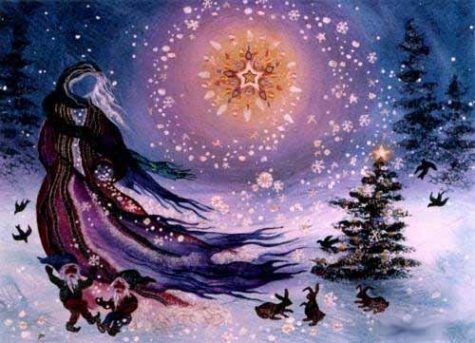 It begins on “Mother Night” and ends twelve days later, on “Yule Night”, hence the “Twelve Days of Christmas” tradition. 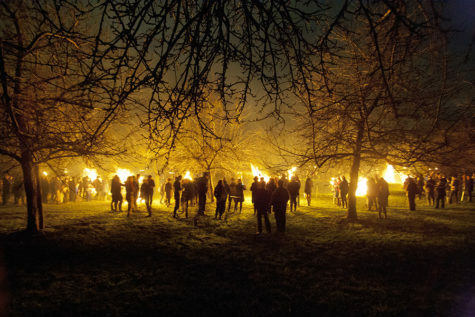 Alban Arthan, unlike all the others, is not considered a fire festival. The Holly King, represents the Death aspect of the God at this time of year; and the Oak King, represents the opposite aspect of Rebirth (these roles are reversed at Midsummer). This can be likened to the Divine Child’s birth. The myth of the Holly King/Oak King probably originated from the Druids to whom these two trees were highly sacred. The Oak King (God of the Waxing Year) kills the Holly King (God of the Waning Year) at Yule (the Winter Solstice). The Oak King then reigns supreme until Litha (the Summer Solstice) when the two battle again, this time with the Holly King victorious. Examples of the Holly King’s image can be seen in our modern Santa Claus. 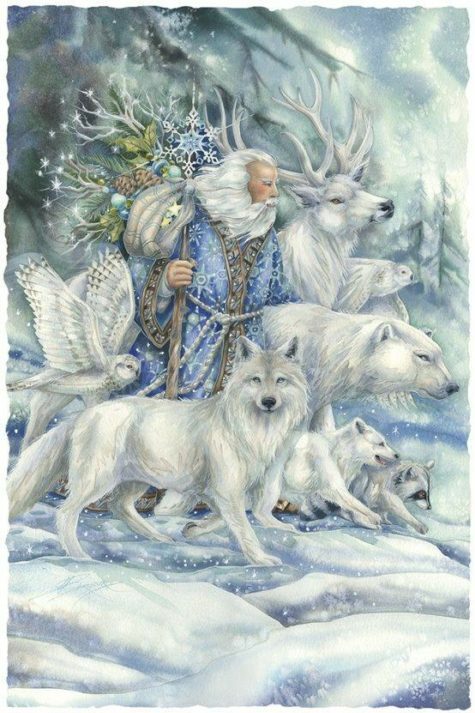 He dons a sprig of holly in his hat, wears red clothing, and drives a team of eight (total number of Solar Sabbats) reindeer, an animal sacred to the Celtic Gods (deer). Mistletoe and holly came into modern Christmas celebrations through the memorializing of this battle. The holly with berries are hung in honor of the Holly King and mistletoe in honor of the Oak King. Although the Holly King and Oak King are mortal enemies at the two Solstices – Yule and Litha – it should be remembered that they are actually two sides of one whole, and neither would exist without the other. 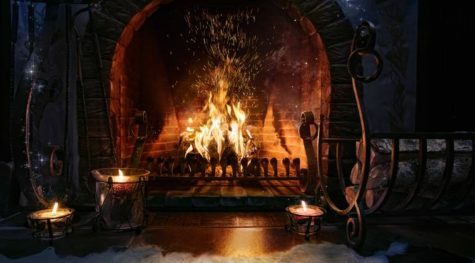 Since this is a Solar Festival, it is celebrated by fire and the use of many candles orthe Yule Log. The colors of the season – red and green – are of original Pagan descent. 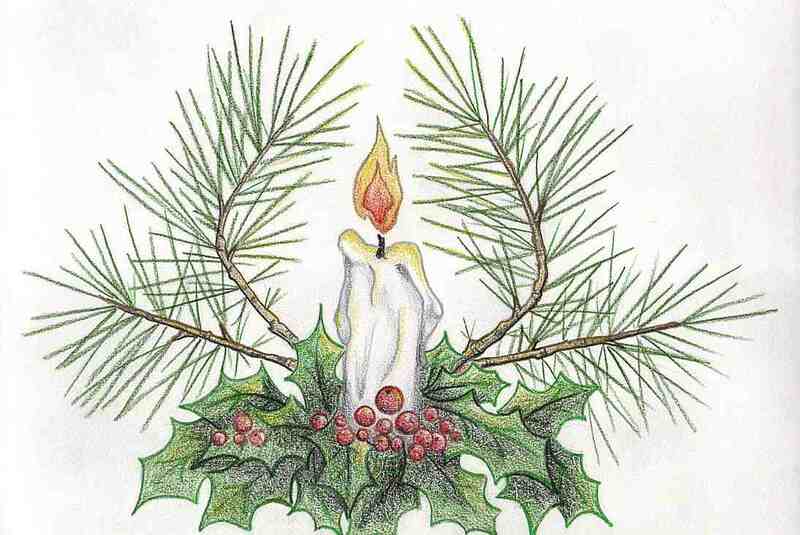 Symbols representing Yule include an eight-spoked wheel symbol, evergreens, wreaths, holly, mistletoe, Yule Trees (very similar to the familiar “Christmas Trees”), or a small potted tree, and Yule Logs. The act of decorating the Yule Tree, wreaths of holly, and the exchange of gifts are also Pagan derivatives. The Yule Tree can be a living, potted tree which can later be planted in the ground, a cut one, or even an artificial one. The choice is yours. Appropriate Wiccan decorations range from strings of dried rosebuds, cinnamon sticks, popcorn or cranberries for garlands to bags of fragrant spices hung from boughs. Quartz crystals can be wrapped with shiny wire and suspended from sturdy branches to resemble icicles. Apples, oranges, lemons, nuts of all kinds and cookies hanging from boughs and branches are strikingly beautiful; and can be real or artificial, depending on your taste. These natural decorations were customary in ancient times. 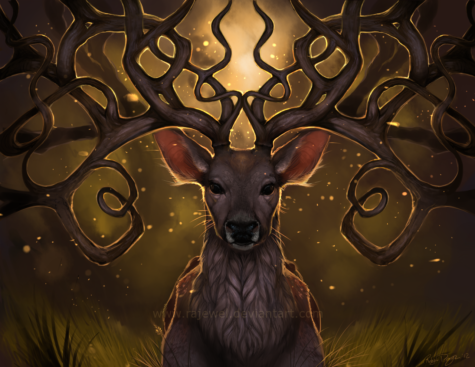 The reindeer stag is also a reminder of the Horned God. You will find that many traditional Christmas decorations have some type of Pagan ancestry or significance that can be added to your Yule holiday. The foods of Yule include nuts, fruits such as apples and pears, cookies and cakes of caraway soaked in cider, and (for non-vegetarians) pork are all traditional fare. 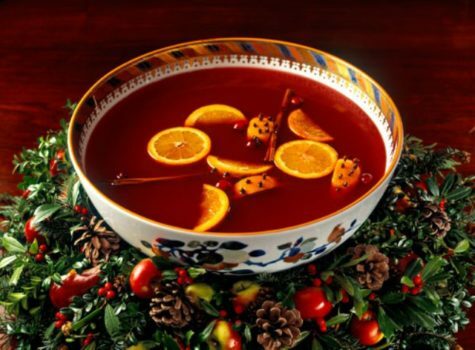 Fine drinks for the Yule celebration or meals include Wassail (a hot drink made from wine, beer or cider, spices, sugar, and usually baked apples—served in a large bowl), lamb’s wool (ale mixed with sugar, nutmeg and the pulp of roasted apples), hibiscus or ginger tea, and apple cider. 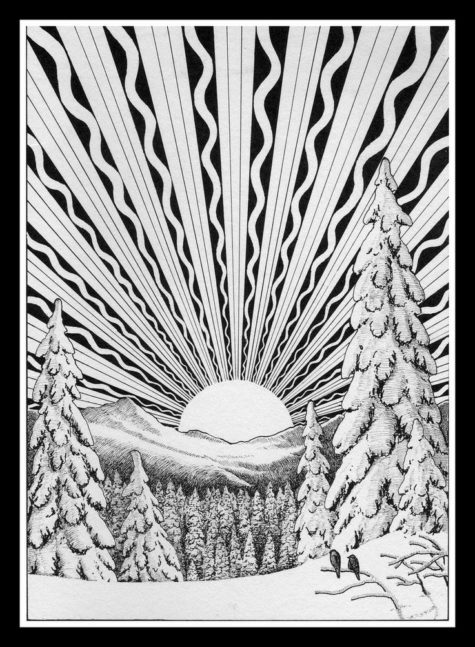 The winter solstice (or hibernal solstice), also known as midwinter, is an astronomical phenomenon marking the day with the shortest period of daylight and the longest night of the year. 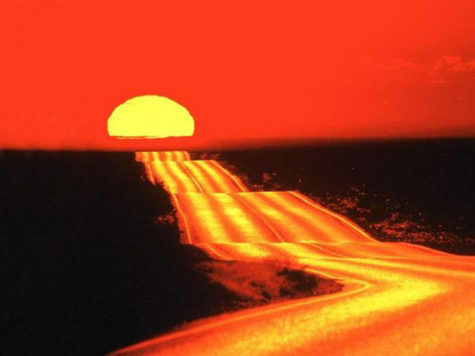 In the Northern Hemisphere this is the December solstice and in the Southern Hemisphere this is the June solstice. 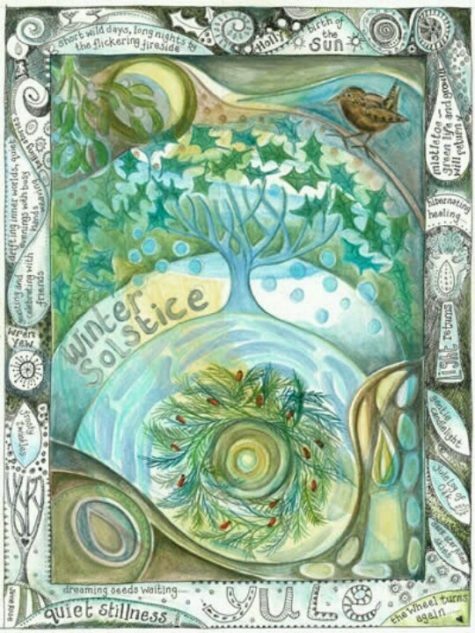 In many pagan traditions the Winter Solstice symbolizes the rebirth of the sun god from his mother, the earth goddess. 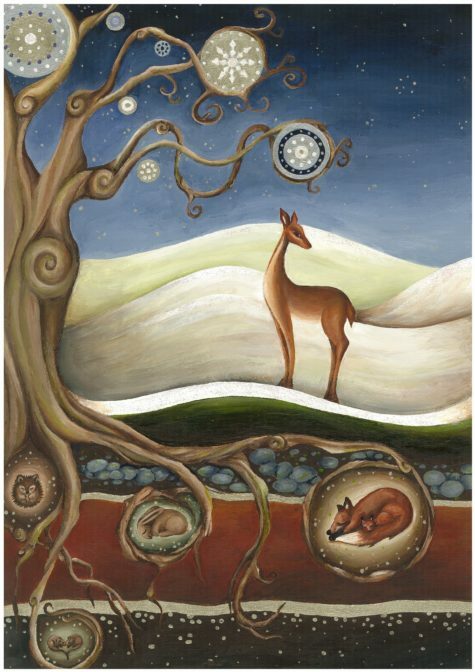 The Winter Solstice is only one of eight seasonal holidays celebrated by modern pagans. The solstice may have been a special moment of the annual cycle for some cultures even during neolithic times. Astronomical events were often used to guide activities such as the mating of animals, the sowing of crops and the monitoring of winter reserves of food. Many cultural mythologies and traditions are derived from this. This is attested by physical remains in the layouts of late Neolithic and Bronze Age archaeological sites, such as Stonehenge in England and Newgrange in Ireland. The primary axes of both of these monuments seem to have been carefully aligned on a sight-line pointing to the winter solstice sunrise (Newgrange) and the winter solstice sunset (Stonehenge). It is significant that at Stonehenge the Great Trilithon was oriented outwards from the middle of the monument, i.e. its smooth flat face was turned towards the midwinter Sun. The winter solstice was immensely important because the people were economically dependent on monitoring the progress of the seasons. Starvation was common during the first months of the winter, January to April (northern hemisphere) or July to October (southern hemisphere), also known as “the famine months”. In temperate climates, the midwinter festival was the last feast celebration, before deep winter began. Most cattle were slaughtered so they would not have to be fed during the winter, so it was almost the only time of year when a plentiful supply of fresh meat was available. The majority of wine and beer made during the year was finally fermented and ready for drinking at this time. 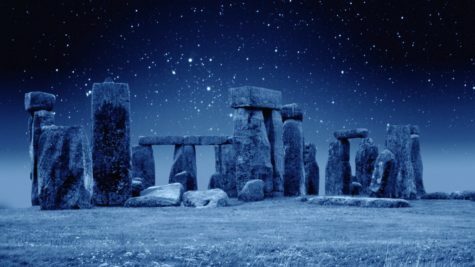 The concentration of the observances were not always on the day commencing at midnight or at dawn, but at the beginning of the pagan day, which in many cultures fell on the previous eve. 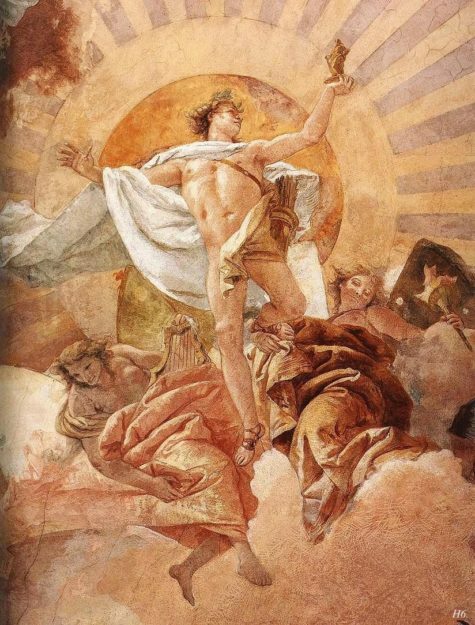 Because the event was seen as the reversal of the Sun’s ebbing presence in the sky, concepts of the birth or rebirth of sun gods have been common and, in cultures which used cyclic calendars based on the winter solstice, the “year as reborn” was celebrated with reference to life-death-rebirth deities or “new beginnings” such as Hogmanay’s redding, a New Year cleaning tradition. Also “reversal” is yet another frequent theme, as in Saturnalia’s slave and master reversals. At the Winter Solstice we celebrate by bringing warmth, light and cheerfulness into this dark time of the year. Holidays such as this have their origins as “holy days”. They are the way human beings mark the sacred times in the yearly cycle of life. On this shortest day of the year, the sun is at its lowest and weakest, a pivot point from which the light will grow stronger and brighter. This is the pivot point of the year. 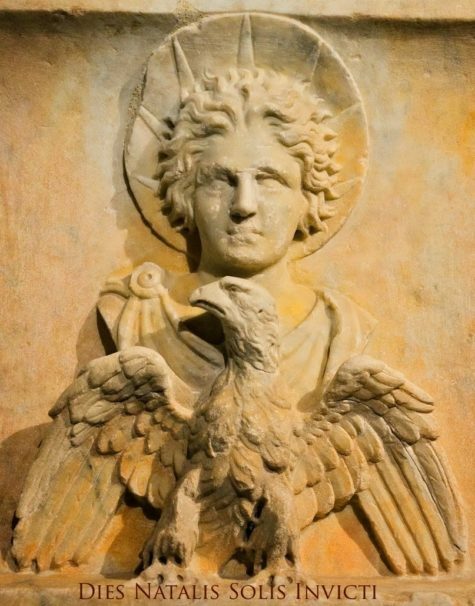 The Romans called it Dies Natalis Invicti Solis, the Birthday of the Unconquered Sun. A simple way to celebrate this day is with a small candle lighting ceremony. The purpose being to celebrate this time of renewal in our lives, to give thanksgiving for the past and the present and to offer a blessing for the year to come. Create a small sacred space. Decorate it in a way that feels cheerful, warm, and bright. In the center place a white candle. As the sun sets on this day, light the candle, and say a few words about bringing the light forth in your life, in the lives of your family and loved ones in the coming year. Either allow the candle to burn out of it’s own accord, or relight it every evening until Jan 1st. 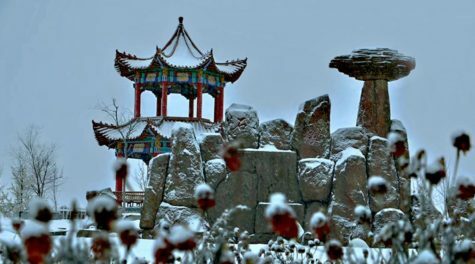 The Dōngzhì Festival or Winter Solstice Festival is one of the most important festivals celebrated by the Chinese and other East Asians during the Dōngzhì solar term (winter solstice) on or around December 22 when sunshine is weakest and daylight shortest. The origins of this festival can be traced back to the yin and yang philosophy of balance and harmony in the cosmos. After this celebration, there will be days with longer daylight hours and therefore an increase in positive energy flowing in. The philosophical significance of this is symbolized by the I Ching hexagram fù (復, “Returning”). 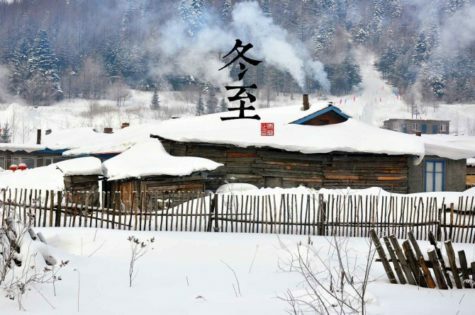 To really get a feel for the Dōngzhì Festival, you have to imagine hard, rural living during a gray Han Dynasty winter more than 2,000 years ago. Now picture a family meal at a table set with hearty, warming foods, raising the hopes for spring’s arrival. That’s the spirit of the Dōngzhì Festival. 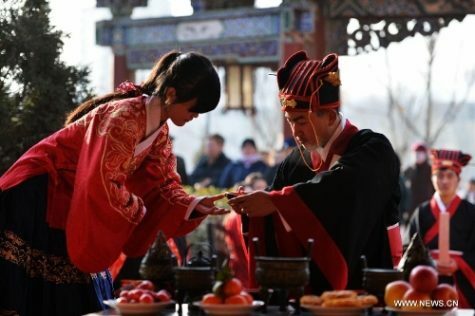 The Dōngzhì Festival marries the winter solstice with nature’s harmonious balance of yin and yang energy. From this point forward, dongzhi (i.e. the extreme of winter) and the negative yin qualities of darkness and cold give way to the positive yang qualities of light and warmth. In other words, take heart — spring will come. Traditionally, the Dōngzhì Festival was a day to regroup with a family get together before tackling the last leg of winter. Today, with survival less of a daily concern and no time off granted, the Dōngzhì Festival is celebrated mostly with a family meal full of warm, hearty foods. One activity that occurs during these get togethers (especially in the southern parts of China and in Chinese communities overseas) is the making and eating of tangyuan, or balls of glutinous rice, which symbolize reunion. 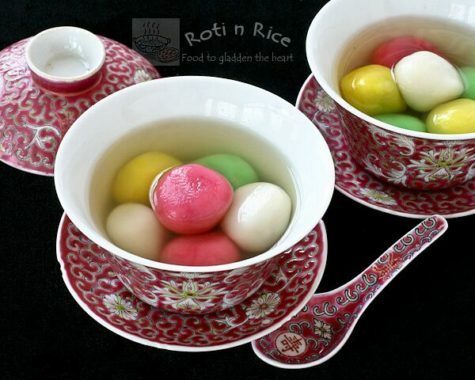 Tangyuan are made of glutinous rice flour and sometimes brightly colored. Each family member receives at least one large tangyuan in addition to several small ones. The flour balls may be plain or stuffed. They are cooked in a sweet soup or savory broth with both the ball and the soup/broth served in one bowl. It is also often served with a mildly alcoholic unfiltered rice wine containing whole grains of glutinous rice (and often also Sweet Osmanthus flowers), called jiuniang. 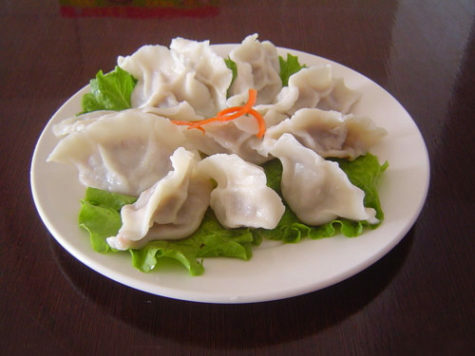 In northern China, people typically eat dumplings on Dōngzhì. It is said to have originated from Zhang Zhongjing in the Han Dynasty. On one cold winter day, he saw the poor suffering from chilblains on their ears. Feeling sympathetic, he ordered his apprentices to make dumplings with lamb and other ingredients, and distribute them among the poor to keep them warm, to keep their ears from getting chilblains. Since the dumplings were shaped like ears, Zhang named the dish “qùhán jiāoěr tāng” (祛寒嬌耳湯) or dumpling soup that expels the cold. From that time on, it has been a tradition to eat dumplings on the day of Dōngzhì. The festive food is also a reminder that we are now a year older and should behave better in the coming year. Even today, many Chinese around the world, especially the elderly, still insist that one is “a year older” right after the Dōngzhì celebration instead of waiting for the Chinese New Year. To Taiwanese people, the festival in winter also plays a very important role. It is also a tradition for Taiwanese to eat tangyuan on this day. They also use the festive food as an offering dish to worship the ancestors. In an interesting twist, in accordance with ancient Taiwanese history, many people take some of the tangyuan that have been used as offerings and stick them on the back of the door or on windows and tables and chairs. These “empowered” tangyuan supposedly serve as protective talismans to keep evil spirits from coming close to children. 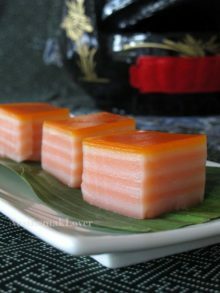 In addition to following some of the customs practiced in China, the people of Taiwan have their own unique custom of offering nine-layer cakes as a ceremonial sacrifice to worship their ancestors. These cakes are made using glutinous rice flour in the shape of a chicken, duck, tortoise, pig, cow or sheep, and then steamed in different layers of a pot. These animals all signify auspiciousness in Chinese tradition. Another interesting custom in Taiwan is that many people take invigorating tonic foods during this particular winter festival. To the Taiwanese, winter is a time when most physical activities should be limited and you should eat well to nourish your body. This practice follows the habits shown by many animals which follow the law of nature and hibernate throughout winter months to rejuvenate and to preserve life. In order to fight cold temperatures, it is necessary to eat more fatty and meaty foods during winter when your body can better absorb the rich and nutritional foods at this time due to a slower metabolic rate. Since Dōngzhì is the “Extreme of Winter”, Taiwanese regard it as the best time of the year to take tonic foods. Some of the most widely popular winter tonic foods enjoyed by Taiwanese to fight cold and strengthen the body’s resistance are mutton hot pot and ginger duck hot pot. Other foods like chicken, pork and abalone are also common materials used in making tonic foods with nurturing herbs such as ginseng, deer horn and the fungus cordyceps. In northern China, people eat lamb dumplings for the Dōngzhì Festival, a tribute to the Han Dynasty physician, Zhang Zhongjing, who served this warming food to poor farmers suffering from frostbite during one particularly cold winter. Celebrating the Dōngzhì Festival is all about understanding the simple enjoyment of a warm, fortifying meal on a cold winter night in ancient China. It’s that same feeling you had as a child when you came in from a day of playing in the snow to a cup of hot cocoa or a bowl of steaming soup. Against that backdrop, this lamb dumpling recipe is the perfect match. The rustic taste of lamb, combined with a black vinegar and chili dipping sauce, gives these dumplings a distinctly northern Chinese flavor. A perfect meal to serve during the depths of winter. 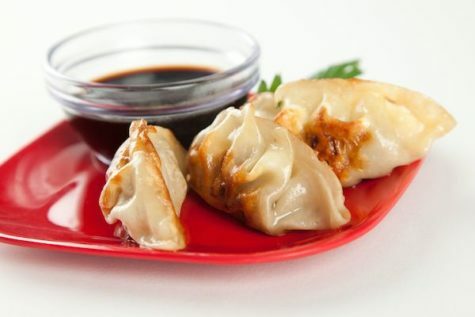 In contrast to traditional pork dumplings, which can be fried as potstickers, these lamb dumplings are either steamed or boiled in thin gow gee dumpling wrappers. The boiled dumplings are soft and slippery, while the steamed dumplings are more elastic, but both versions produce a satisfying broth that makes the dumplings feel like xiao long bao. If your Chinese market is in a predominantly Cantonese neighborhood, you may find that it doesn’t carry lamb. In that case, a halal market will probably be your next best bet. Make sure to pick a relatively fatty ground lamb mix, so that your dumplings produce a rich broth. 1. Finely mince the cabbage in a food processor. Place in a large bowl, sprinkle with the salt and set aside for 10 minutes. 2. Add the lamb, ginger, green onion, soy sauce, rice wine and cumin to the food processor. Pulse 5 times until the ingredients are combined well. Set aside. 3. Place the cabbage on a kitchen cloth, twist the top and squeeze out as much liquid as you can. Add the dry cabbage to your pork mixture and combine in the food processor with another 5 pulses. 4. Spoon 1 rounded teaspoon of the filling mixture in the center of each dumpling wrapper. To wrap a dumpling, dab water along the inside edge of the wrapper, fold in half to form a semicircle enclosing the filling, then seal the edges together to stick. Finally, fold 5-6 small pleats around the top edge of the dumpling. Repeat until all of your dumplings are done. 5. Separate the dumplings you’ll need for your meal and then freeze the rest in a heavy plastic bag for later. 6. 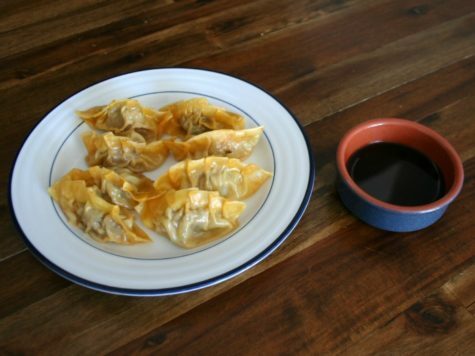 There are two easy ways to cook dumplings. – To boil: Bring a large pot of water to a boil. Add 15 dumplings to the pot and boil for 9 minutes, stirring occasionally to prevent them from sticking to the bottom of the pot. Remove the dumplings from the heat and drain, repeating with any remaining dumplings. – To steam: Place a bamboo steamer in a large pot or wok and heat water to a boil. Place 15 dumplings in a single layer in the bamboo steamer, cover and steam for 9 minutes. Remove the dumplings from the heat. 7. Serve immediately with chili sauce, black vinegar or soy sauce for dipping. Wassailing means “to wish health to” one’s apple trees, in the hope that they will bear well. In addition, drums, bells, whistles etc. 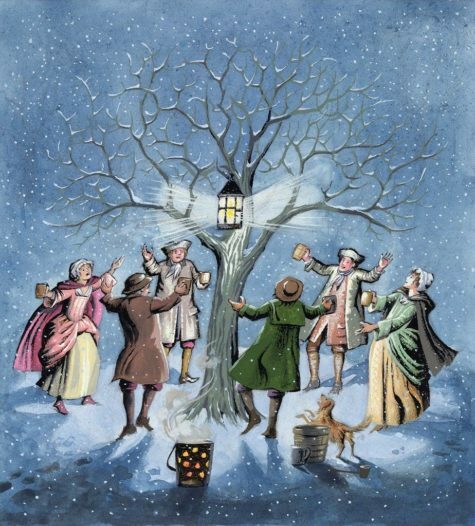 were used either to scare off evil spirits, or to wake the tree up; a libation of cider or ale was poured over the roots, and bread that had soaked in the ‘wassailing’ bowl was placed in the branches – an offering back to the tree. Recipes for wassail are numerous and varied. Some call for the use of apple cider, some for wine. 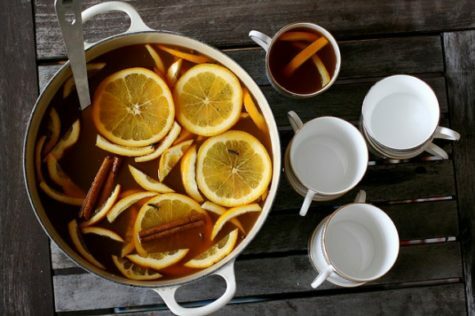 The basic idea is that you are making a hot spiced drink and serving it in a bowl amidst love and laughter. Here is a simple recipe that calls for cranberry and orange juice. Feel free to experiment and substitute. Put everything into a large soup or stock pot and bring to a low simmer. If you added honey or sugar, mix gently until it dissolves. Lower the heat and very low simmer the mixture for 2 hours before serving. Keep it on low or use a crockpot on low if serving over hours. The longer you heat, the more infused the flavors will be. Orange slices or orange wedges studded with cloves, cinnamon sticks, and cranberries can be floated in the pot and simmered along with the rest of the ingredients. When you are ready to serve your Christmas Wassail, just ladle into your favorite mug and enjoy. This delicious and warm drink is a holiday treat! Garnish with a cinnamon stick if you like.